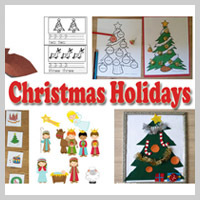 Preschool and Kindergarten Hanukkah and Kwanzaa Crafts, Activities, Lessons, Games, and Printables. 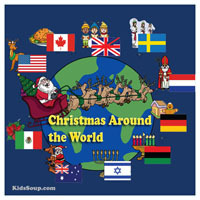 Around the world, people from different countries and different families celebrate the winter holiday season in different ways. 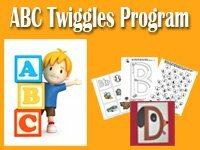 Some with twinkling lights illuminating trees and houses, some with jolly old Saint Nicholas, hanging stockings from fireplace mantles, lighting candles, and giving presents. Whether you celebrate Christmas, Hanukkah, and/or Kwanzaa, it's a time of gift giving, reflection, and to be with family and friends. 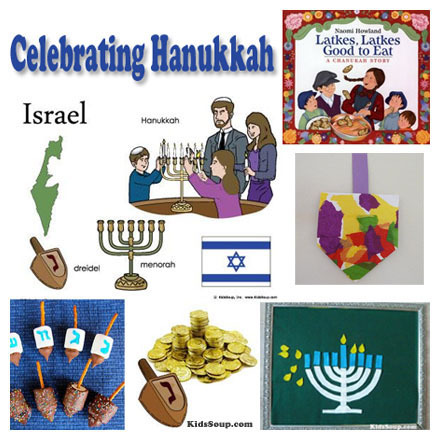 Introduce your children to Hanukkah the Celebration of Lights and Kwanzaa with our crafts, activities, games, and resources to help your children get familiar with these celebrations. 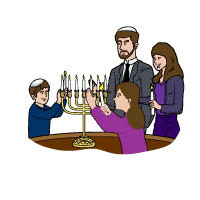 To introduce children to the meaning of Hanukkah, read the book The Festival of Lights: The Story of Hanukkah by Maida Silverman and Carolyn Ewing or another book about Hanukkah. Tell children the story about Hanukkah (also known as Chanukah), the Jewish Festival of Lights. 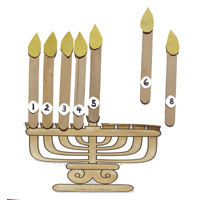 The Menorah is a nine-branched candelabrum. 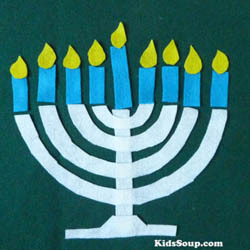 The ninth branch is for a so-called "helper" candle, called the Shamash. Each of the eight candles represent one of the eight nights of Chanukah, which in turn represent the miracle of Chanukah. 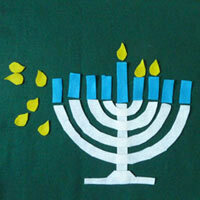 Each night one candle is lit, until on the eighth night of Hanukkah all eight candles, plus the shamash, are lit. 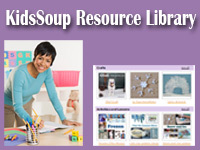 Menorah Candle Activitiy available inside our KidsSoup Resource Libary. Shining its light upon us all. Here’s a little candle burning bright. Another Hanukkah custom is playing with dreidels. 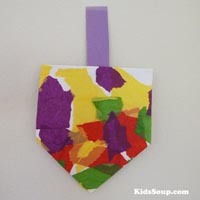 A dreidel is a four-sided spinning top with a Hebrew letter on each side. The letters on the dreidel, Nun, Gimmel, Hey and Shin, stand for the Nes Gadol Haya Sham, which means "A Great Miracle Happened There." 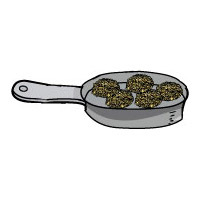 Latkes (potato pancakes) are a traditional Hanukkah food which is fried in oil. 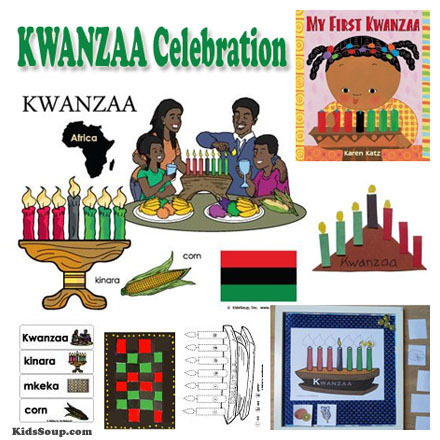 Introduce children to the Kwanzaa holiday and celebration. 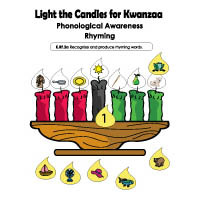 Great books to use for preschool and kindergarten are Seven Days of Kwanzaa by Angela Shelf Medearis or My First Kwanzaa (My First Holiday) . 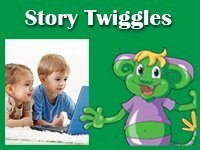 Explain to children that Dr. Maulana Karenga created Kwanzaa in 1966 because he wanted African-Americans to have a special time in which they could celebrate their heritage, or past. 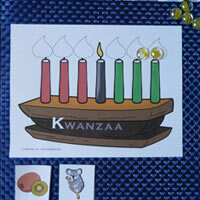 The word “kwanzaa” means “first” and symbolizes the first fruits of the harvest. 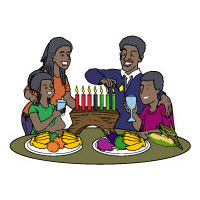 The Kwanzaa celebration lasts seven days, from December 26 to January 1. Each of the seven days of the celebration is dedicated to one of the seven principles. A candle is lit each day on a special candlestick called the “kinara” to represent these principles. People celebrate through singing, speaking, and dancing. 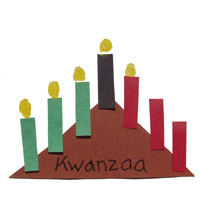 The kinara is the candle holder used in Kwanzaa celebrations in the United States. The colors of Kwanzaa are black, red and green; black for the people, red for their struggle, and green for the future and hope that comes from their struggle. On the kinara is one black candle, three red, and three green candles. Symbol of unity. Before drinking out of the cup, each person says "harambee," or "let's pull together." Symbolize stalks of corn of the roots of the African people. A different candle is lit each day one for each principle. Symbol of our children and our future.